In just 24 hours Mark Zuckerberg’s fortune swelled by $3.8 billion. It happened between 4:05 pm Eastern Time Wednesday, when the Internet giant reported second quarter earnings that dwarfed expectations, and the close of trading the following day. 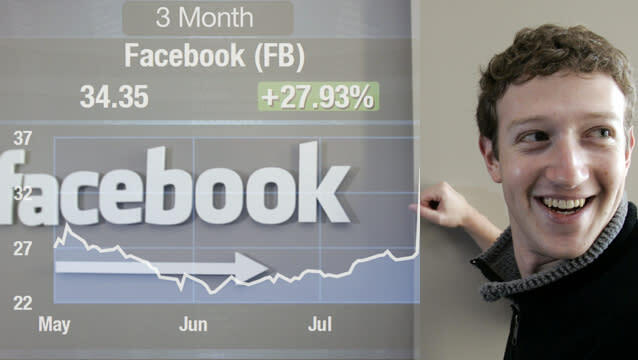 Facebook (FB) shares soared 30% to their highest level since May 2012, earning the company’s founder and CEO the equivalent of $15.83 million per hour. The 29-year-old Zuckerberg is now number 42 on Bloomberg Billionaire’s list, with a net worth of $16.8 billion. He was number 75 before the latest Facebook earnings were released and so far this year his net worth has swelled by 37%. Gates and Zuckerberg are amongst several tech leaders on the billionaires list which includes Larry Ellison ( ORCL), Jeff Bezos (AMZN) and Sergey Brin (GOOG). Zuckerberg is richer than Nike co-founder Phil Knight, Rupert Murdoch, Brooklyn Nets owner Mikhail Prokhorov and Laurene Jobs, the widow of Steve Jobs. Jobs, of course, was one of the people Zuckerberg admired most. “A lot of the old school tech guys will remain in the top 20, 50, 100 of the world’s richest,” says Miller. Watch the video above for more on Zuckerberg's big day and his fellow billionaires.